Less than 30 days and counting – but it is not too late to take decisive action! To secure your tickets for our Charity Lunch and Auction at Sandown Park Racecourse in Esher on Wednesday 20 September, please act now. This is the most important fundraising event of our year and a time when we really need your support. Once again we have some fantastic auction items for you, including holidays and money-cannot-buy treats. For a reminder of the full details of the Sandown event, please click here. On the day, just make sure you are there on time for the Champagne Reception, starting at 11:00 am, followed by lunch and charity auction in the Solario Suite with panoramic views over the racecourse, and a great afternoon’s racing with afternoon tea served at your table. This year we have secured the services of our very own bookie in the Solario Suite: Star Sports -The Gentleman’s Bookmaker. Is this something special? Yes it is, as Star Sports will donate all their profits for the day to the charity. And gentle ladies, do not be offended, your bets will be treated with the respect they deserve. 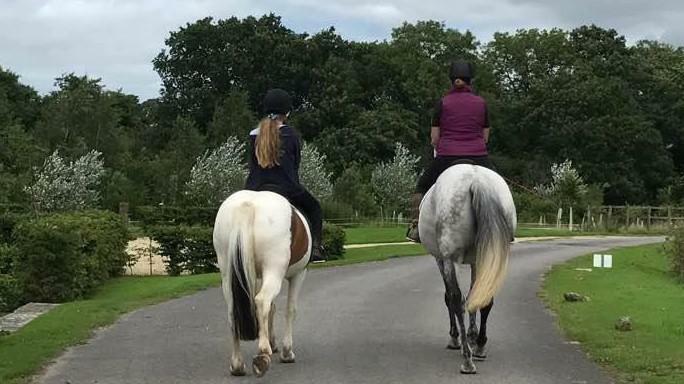 With the team of Ruth and Jemma and our volunteers well settled in at Brewham Lodge Stables, the last couple of months have brought lots of activity and some very positive news of our horses. 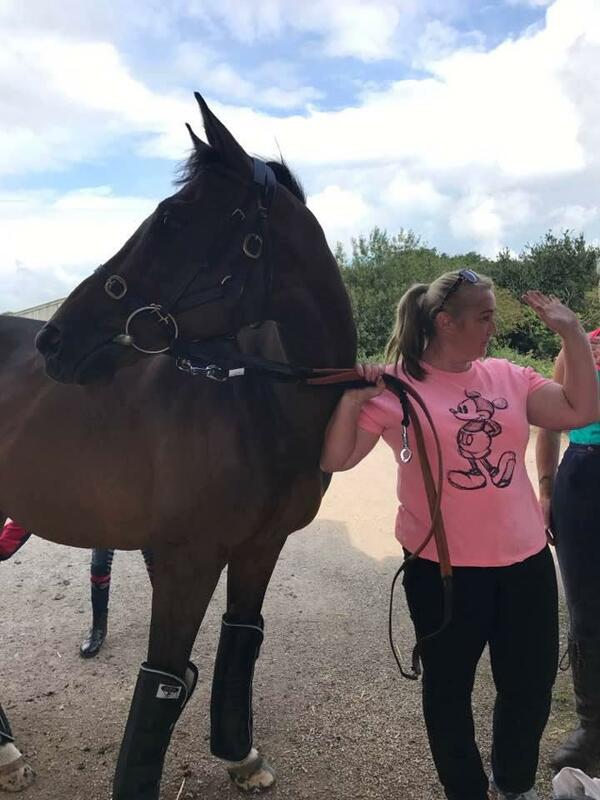 One of our newcomers at Brewham Lodge Stables has been Baddilini, a 7-year old bay gelding by Bertolini, and the winner of five rules races. 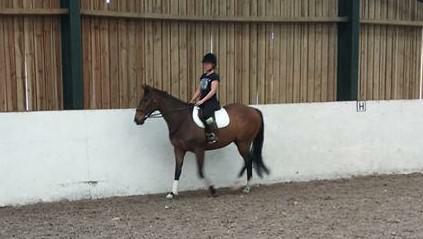 Here he is having his first assessment in the riding school and what a star he was. We all prepared ourselves for the worst – we have to in this business - but apart from a quick hop, skip and jump he behaved impeccably. This chap is a very interesting horse and Graham and the team feel some good times will be had preparing him to step out into the world and make a name for himself with one lucky person, that's a way off yet though. 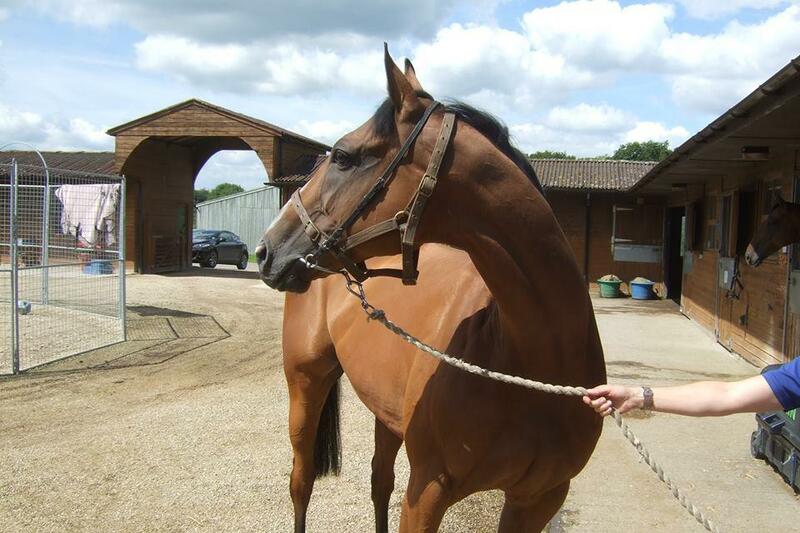 Another newcomer is this lovely 8-y-o chestnut gelding Red Rust by Proclamation. Red is beginning to feel more at home and despite a little nervousness initially, he has settled well. There is definitely more to this chap than meets the eye, he is a very caring horse but quite deep. Chances are he doesn't want to give away more information about himself than necessary at this early stage, possibly saving the best till last. Watch this space. But perhaps not for too long: both these chaps, Baddilini and Red are really making progress, and in the process making friends, after an introduction to the outdoor school, here they both are enjoying a wind down stroll in the summer sunshine between rain showers! Here The Betchworth Kid, BK to his friends, looks back with fond memories as he says goodbye to Brewham Lodge Stables and sets off on his new adventure to become part of his old friend Tracy's family in Berkshire. As a pair these two go back many years as Tracy was responsible for backing BK when he was a baby and then throughout his racing career she looked after him between seasons when he was on his holidays, between then they have already had many good times and the plan is that they will have many more in the future. We will miss BK causing havoc in the yard and careering around the paddock when he doesn't get his own way but mostly the late night cuddles shared when everyone else had gone. Here's to a great future for the pair of them. The big day for Drunken Hays or Murphy as he is known and One Cornetto finally came around and both travelled like lambs to their new foster home with Alex in West Sussex. Murphy acted as stick man and led the way off of the lorry, followed by a very laid back Cornetto. A quick wash down in front of their new stables and cooling off period, then out into their lovely new paddock. These two besties had loads to talk about by the end of an exciting day and great to know that these great friends did not have to be separated for each other. Another big day, this time for Smart Mistress, or Smartie as she is known, and her new keeper Lorraine hack off into the distance - actually to the yard next door - to start their new lives together and is fascinated by the new sights and smells in her new home. Smartie really is as genuine as a day is long yet still has so much untapped potential. Although this gorgeous grey mare may have left the yard we will still be seeing her very regularly as her and Lorraine hack back around the corner into the Centre to use the indoor and outdoor schools and hopefully enjoy some super hacks out with her old buddies. Meet West Leake, a recent arrival at the Centre. 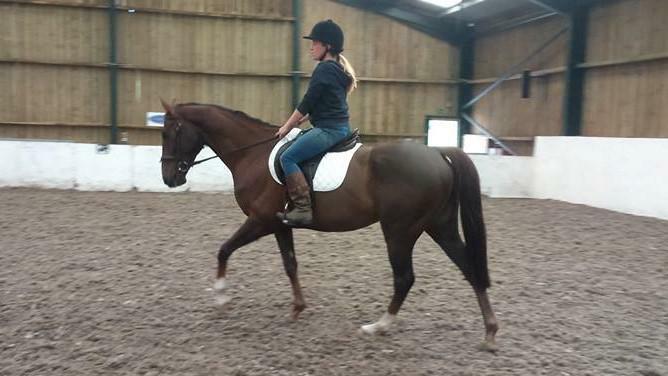 Reg as he is known is a super looking, full of fun 11-year old bay gelding by Acclamation who stands approximately 16.2hh. 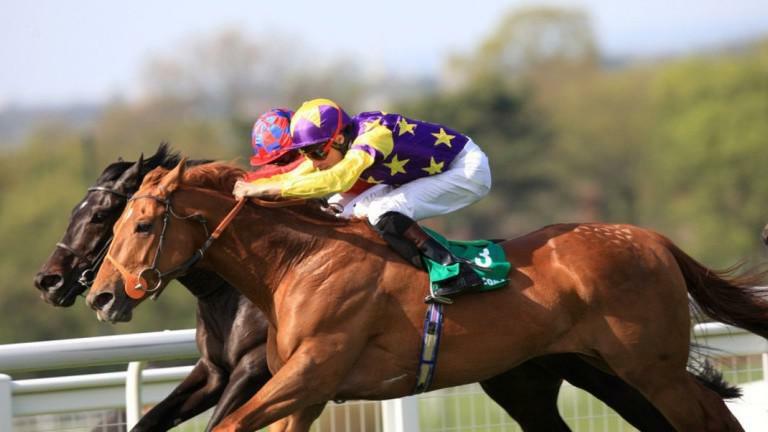 Having ran in 100 races in which he won 11 times and was placed in another 8, Reg has been retired very sound and well thanks to his previous owner. A touch overawed by everything at this early stage this good looking chap who has no stable vices or nasty thoughts just might end up teaching us a thing or two as he is obviously very intelligent and just weighing up his current situation and working out how best to handle it. Watch this space as Reg could turn out to be a bit special. Also meet Three White Socks, needless to say known as Socks, our latest arrival at Brewham. 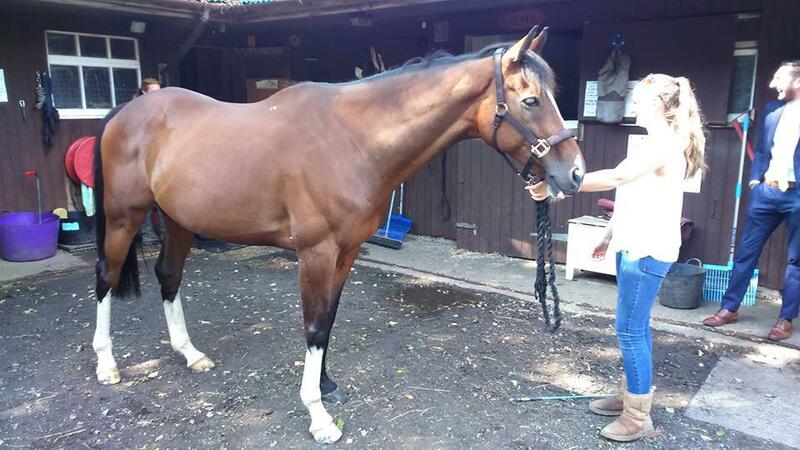 This super 10-year old gelding by Whipper suffered a hock injury some time ago but is well on the way to making a full recovery and is now very sound; he only comes to us because his owner is emigrating and wanted to ensure a safe future for his horse. Socks is a lovely character who tries his hardest to please in every respect and has no stable vices. When the time is right and he is ready to venture out to his forever home this smashing chap will be sure give that one lucky person so much fun and companionship it simply cannot be measured, no hurry though as he is a pleasure to have around. Graham and Sue enjoy new canine companions, but we have to report the sad loss of a steadfast supporter. 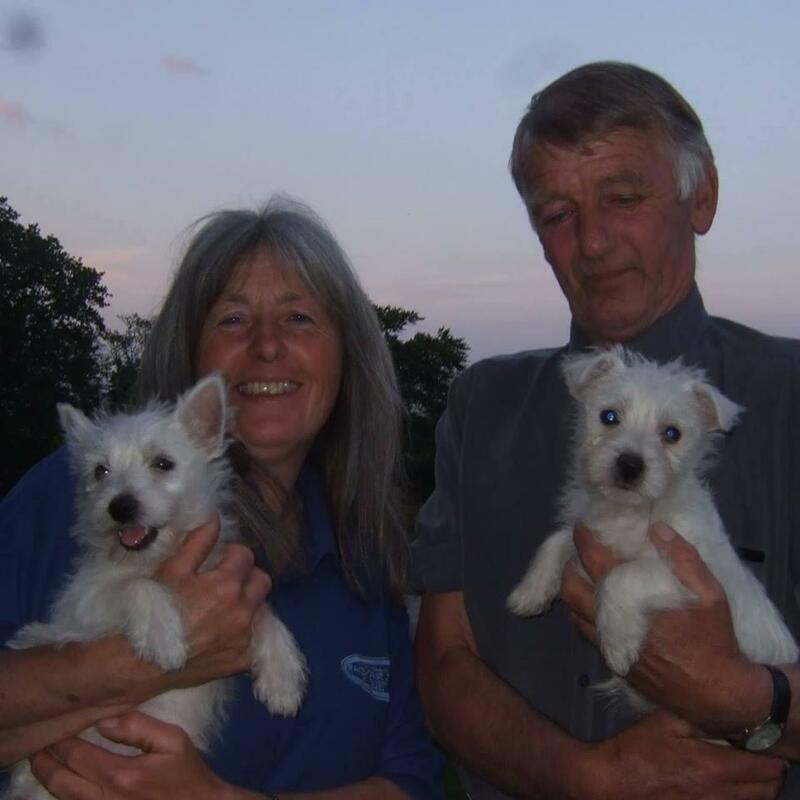 Our Co-founders Graham and Sue are totally committed to the care and welfare for the horses taken on by the charity, based on decisions made by Graham. But it is great to know they share their love of animals. Here is a picture of them with the new canine companions in their life. However it is with very great sadness that we must announce the death, after a short illness, of Viv, a dear friend and great supporter, whose favourite horse was Sher Royal, otherwise known as Roy; see attached picture. We first knew Viv about 12 years ago, when she and her friend Mary offered to help us with yard duties. Viv had always loved horses but had no direct experience with being around them. So it was a Big Day when she and Graham first entered Roy’s stable together, and Viv felt the joy of being close to – and trusted by – such a beautiful animal. Some weeks later, bringing Roy in from the paddock represented another exciting milestone reached . . . Over the years Viv – always keen to learn more about her charges, and horses in general – brightened up our lives with her readiness to rise to Graham’s ‘horse quiz’ challenges. Usually much laughter would ensue! 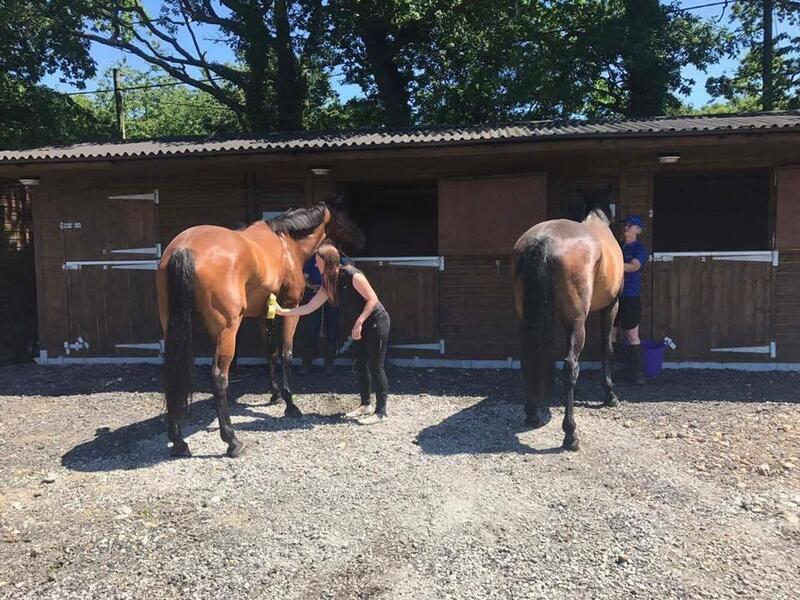 As well as her hard work directly with the horses, with whom she became an accomplished and confident groom, Viv also gave much to help stock the yard and bring a professional look to its occupants, both equine and human. She provided personalised sweatshirts for the yard staff and volunteers, rugs for the horses, headcollars, buckets and much, much more . . . . she always carried a ‘mental shopping list’ for the Sanctuary and its residents. Ever willing to turn her hand to any task, and to exchange a friendly greeting, Viv was a very popular presence, with horses and staff alike. Viv – you were a star, shining brightly, lighting up our days with your considerable skills, warmth, humour and great generosity. We needed you - we will all miss you very much . 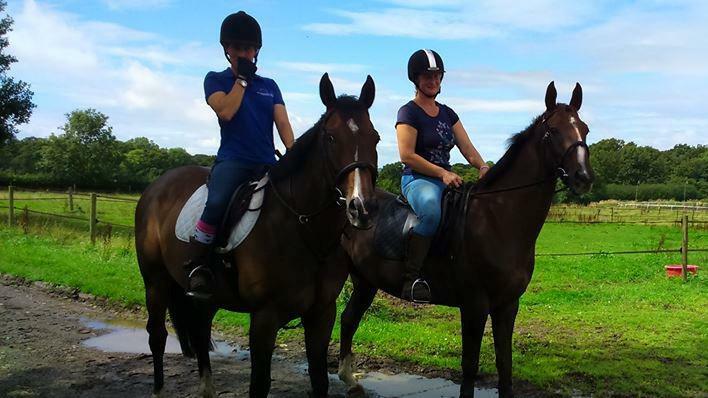 . .
Congratulations and heartfelt thanks to Selena for taking on The South Downs Challenge on behalf of all the thoroughbred horses in our care. 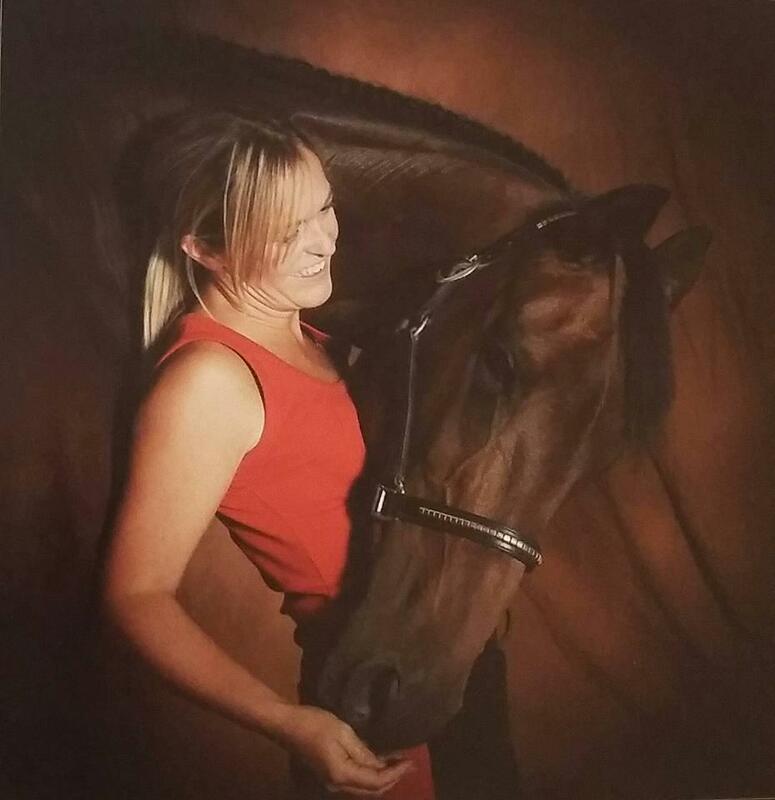 Selena has worked so hard to prepare herself for a gruelling 100 Km challenge in memory of her thoroughbred mare Ellie. Congratulations Selena on a fantastic personal effort in tackling the South Downs Challenge; you deserve our heartfelt thanks for your initiative and perseverance on behalf of all our horses. What wonderful and generous friends you have, to have raised over £2,500 including Gift Aid for the charity, through your JustGiving page: a truly superb effort all round. You are currently top contender for the Sanctuary Fundraiser of the Year Award 2017. WANATED: Volunteers to emulate Selena and raise funds for The Racehorse Sanctuary by signing up to tackle one of the 2018 Ultrachallenges. Unexpected but very welcome support from The Platform 4 Book Nook on Oxford Station and sharing the proceeds from the second annual charity ball organised by the veterinary nurses at the House & Jackson Equine Hospital in Essex. We have been blessed with some wonderful but unsolicited support this summer, helping fill the hungry gap in the charity’s finances before our major fundraising at Sandown Park next month. As well as Selena’s challenge efforts, Vivienne set herself the target of completing The Race to the Stones 2017, billed as the UK’s No1 ultramarathon from the Chilterns along the heights of the North Wessex Downs to the Averbury Stone Circle. 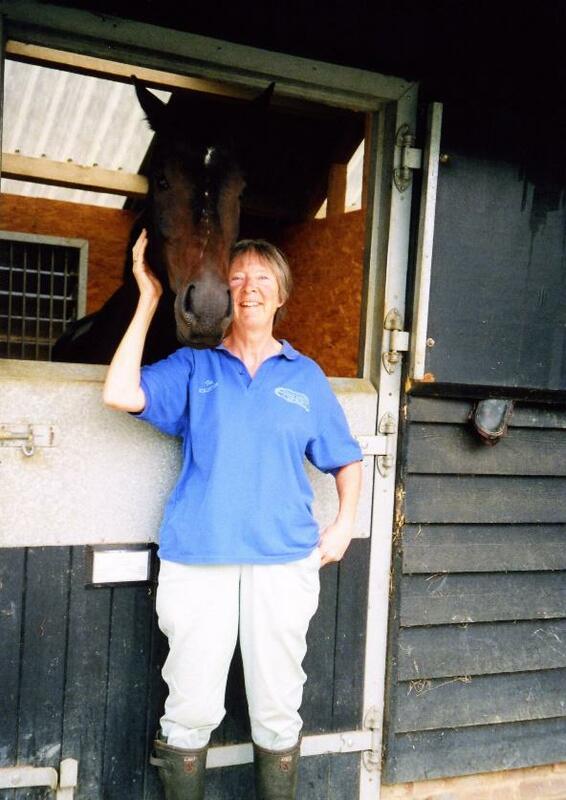 You can read about Vivienne’s fundraising for The Racehorse Sanctuary on her dedicated JustGiving page. Thank you so much Vivienne for your wonderful efforts on behalf of our horses. 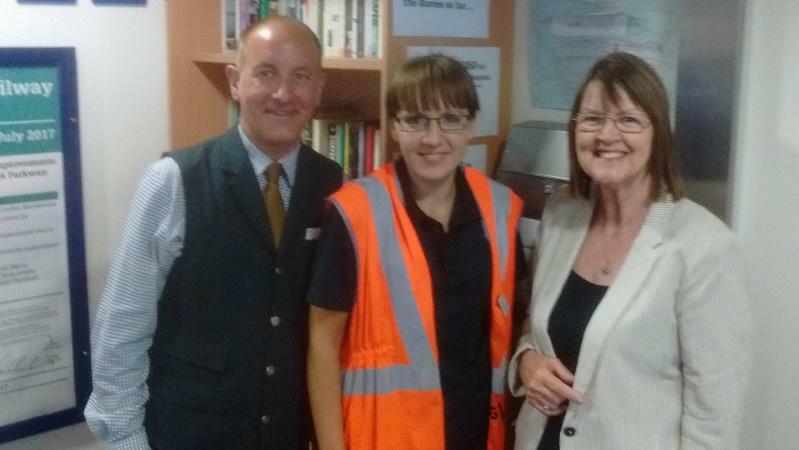 Huge thanks to the staff at Great Western Railways’ Oxford Station who voted for The Racehorse Sanctuary to join the list of charities to benefit from funds raised by The Book Nook on Platform 4 of the station. Travellers can borrow or retain books from an eclectic mixture of second-hand book, in exchange for making a charitable donation. This initiative has proved so successful in raising significant donations but also boosting staff morale and performance, that GWR have contributed matching funds. Our volunteers Val and David visited The Book Nook to express our thanks and to invite GWR staff members Tim and Anna, seen here with Val, and their boss Warren, to visit Brewham Lodge Stables. For another wonderful surprise we have to thank veterinary nurse Michelle and her colleagues for choosing the Sanctuary to share in the charity proceeds of the House & Jackson Summer Charity Ball, held this year at Chelmsford City Racecourse in July. In view of the venue they decided that racing charities should be the beneficiaries of their considerable charitable efforts and they selected as the lucky recipient charities The Injured Jockeys Fund and The Racehorse Sanctuary, attracted in our case by our emphasis in fostering our ex-racehorses. Michelle you and your friends did us proud, channelling your efforts to raise funds for the two racing charities in this way, whilst having a great deal of fun. 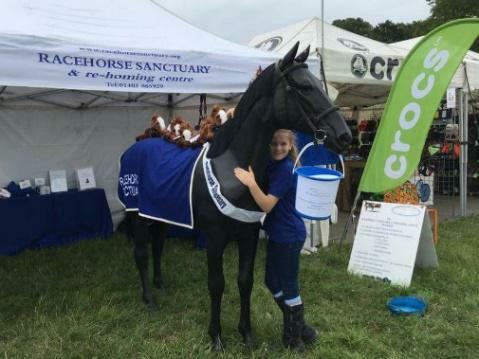 On behalf of all the team, the horses and the Sanctuary itself, we want to THANK every one of you who came to see us at Yeovil Show, introduce yourselves, tell us your retrained racehorse story and make a donation to help us give more retired racehorses a second chance. You really are all amazing! Meanwhile Sue helped by volunteer Debbie had a stand at the Ashington Festival in West Sussex. Despite variable weather the many visitors were very interested in our work and how we go about it. Our thanks go to Helen who spent most of the day helping out and Margaret who produced a wonderful cake with a picture of Ollie's head covering the top which was used as for the Guess the Weight Competition. We must also thank all the local businesses who so generously donated such wonderful raffle prizes for the day, not to mention Jenny and Rowland who supplied the marquee, which proved to be essential at times. A good time was had by all and many more new acquaintances were made, thanks to all who came along to visit our stand and support the day. 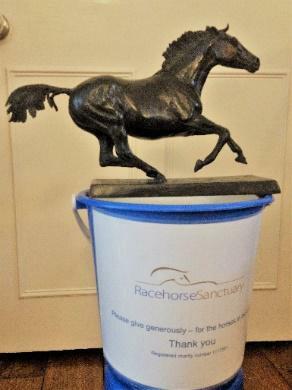 A huge thank you for those noble volunteers who gave up their Saturday afternoon to collect for the Sanctuary on the final day of Glorious Goodwood: Thank you Val, Patrick, Jane and Jane’s sister what a wonderful effort, you must have been staggering to collect over £1,700 in your buckets. 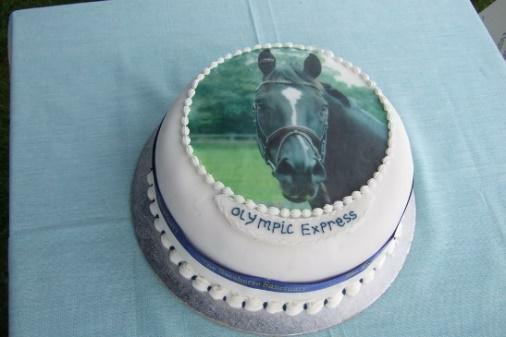 Also another huge thank you to Ridemore Equestrian of Wincanton. They've been very supportive and generous to the Sanctuary since we arrived in Somerset, and especially to Chloe, one of their staff who managed to get us some really super prizes from various suppliers, to offer in a raffle held at Ridemore, in support of our work. Quiz Nights are back for the aficionados: put Saturday 16 September in your diaries. On Saturday 16th September due to popular demand we will be staging a summer quiz evening at Ashington Community Centre, Foster Lane, Ashington RH20 3PG in Horsham District, West Sussex, starting at 6:30pm until 9:30pm. We are expecting even more teams this time so please create and fill out this form and return it early as teams will be limited. The deadline for team entries will be Monday 11th September 2017. There will be a fish/chicken and chip supper and tea/coffee and biscuits included, bring your own alcohol if you wish. This is a really good fun evening including a raffle draw and of course the quiz itself and it raises much needed funds for the centre so do come along and support if you are able to. Graham and Sue look forward to seeing you on 16th September. 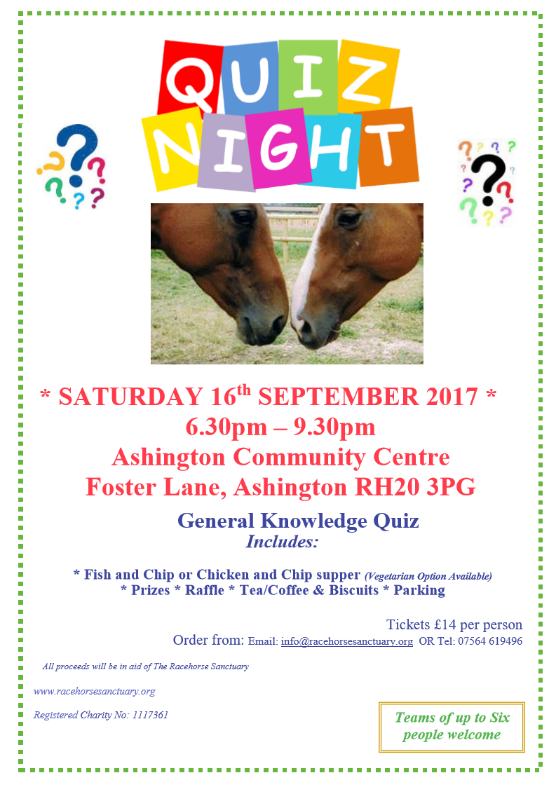 WANTED: Generous sponsor for hire of Ashington Community for the evening. We have chosen our 2017 Christmas card; and keep Saturday 9 December free in your diaries for the Thoroughbred Ball. 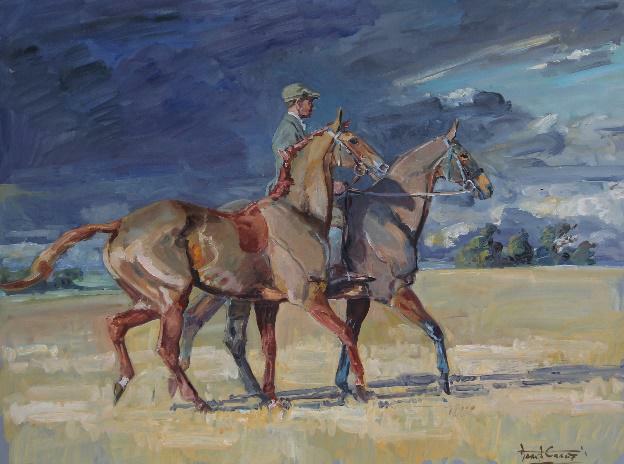 Once again popular sporting artist Daniel Crane has very kindly allowed us to use one of his wonderfully atmospheric horse paintings for our 2017 Christmas card, which will be going on sale at our Sandown Raceday on Wednesday 20 September at Sandown Park. If you cannot make Sandown, full details of how to order your own cards will be available in the next issue of From the Horse’s Mouth. IMPORTANT: do remember to keep the date of Saturday 9 December free in your diaries for the 2017 Thoroughbred Ball in aid of the work of The Racehorse Sanctuary and especially this year for the operation of our new Peter O’Sullevan High Dependency Unit. Do not delay, book early and secure the early bird price.